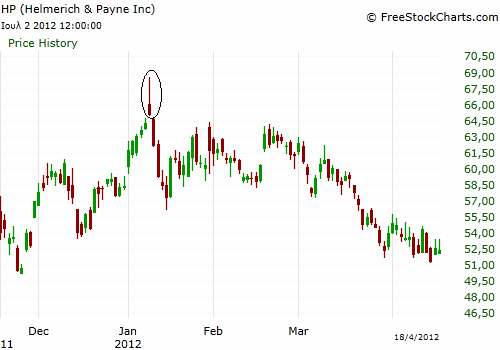 The shooting star bearish candlesticks pattern is the opposite of the inverted hammer. In order to provide valid signals an uptrend must be in place before the pattern occurs. The shooting star can be either color, green or red. Bellow follows its graphical representation. After a price advance and a gap up a candlestick is formed which has a long lower tail and a small body. This is the first sign that sellers are starting to react after a period of aggressive buying. In the daily chart of HP a shooting star has formed after a steep upward price movement, that signals the beginning of a new downtrend. In order for the pattern to be valid and trustworthy it must be visiting an already existing resistance level. Preferably, in order to augment the possibility of success we want the market to be also in a midterm downtrend or forming at the same day a bearish candlesticks pattern after visiting for the first time a resistance level. The stop loss here should be placed above resistance or above the high of the shooting star. If we enter at the close of the session we have to put a relatively big stop and this is the disadvantage of the pattern.